Bees are nature's pollinators and are in serious danger from pesticides. However we may need to get rid of them if they start to set up house in near our homes. Here is how to safely and naturally do it. 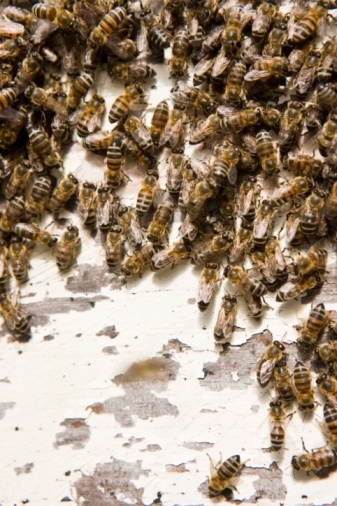 If you spot a small group of bees congregating on your house you might want to eliminate them before they form a colony. Once a hive is started and the queen arrives you will have to call a professional exterminator or beekeeper since getting rid of a hive is very dangerous, especially if they may be Africanized or "killer bees". You should always try to find a local beekeeper to "adopt" any bees that start forming a colony on your property first. If unable to do so, then proceed with plan B. If you spot a dozen or so bees forming a hive at the early stages and have not found a local beekeeper to take them, you can get rid of them with soapy water. Put on A heavy coat, long pants, a hat and scarf just in case your soapy water does not get them. Place 3 tablespoons of Dawn soap in a garden hose sprayer half full of water and set it on the highest dose setting. Shake the mix and spray some to test it for soapiness before approaching the bees. If it is good and sudsy go ahead and spray them and make a hasty retreat inside. Another method is to put about 5 tablespoons of Dawn soap in a plastic mop bucket about a quarter full and douse them with the water. This works for bees and wasps as well. Don't attempt this if the colony is large (more than a dozen bees or wasps) and absolutely not if you have any allergies.